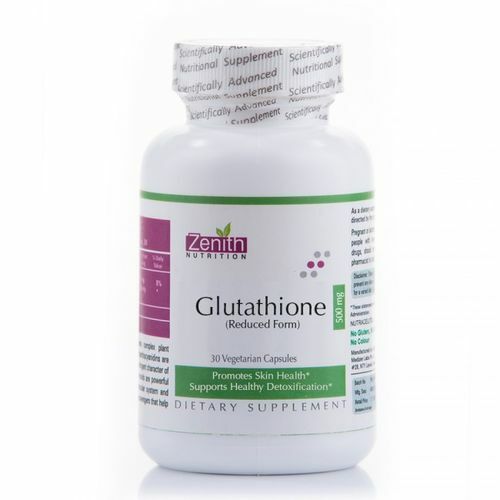 Zenith Nutrition Glutathione is enriched with the goodness of Glutathione that is a small peptide molecule composed of three amino acids: cysteine, glutamic acid, and glycine. It is produced primarily in the liver and is involved in many critical biological functions in the body including metabolism of toxins, immune system function, protection against oxidative cell damage, and recycling of vitamins E and C. This product has Glutathione in its reduced, active form for optimal bioavailability. Supports antioxidant function, healthy detoxification and skin health. Alternatively, you can also find many more products from the Zenith Nutrition Glutathione 500 Mg Capsules range.